Congress is back in session this week and the Senate Appropriations Subcommittee on Labor, Health and Human Services, Education and Related Agencies started off the week with a hearing on the Fiscal Year 2019 (FY19) Budget for the U.S. Department of Education. 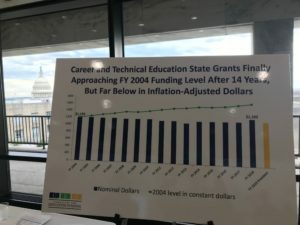 Read below to find out more about hearing, Advance CTE’s advocacy on the federal investment in Career Technical Education (CTE), remarks Secretary DeVos gave this week and a new fact sheet on the role of a State CTE Director. On June 5, the Committee for Education Funding hosted an event for Congressional staff to learn about and discuss the federal investment in the full continuum of education programs. Advance CTE participated in the event and shared resources on the need to increase the federal investment in Perkins with attendees. Looking for resources to share about the federal investment in CTE? Check them out on our website. On June 7, Secretary DeVos provided remarks at the International Congress on Vocational & Professional Training in Zurich, Switzerland. Secretary DeVos discussed the connection between education and the economy and the need to adapt over time, apprenticeships and more. She noted that, “students must be prepared to anticipate and adapt. They need to acquire and master broadly transferrable and versatile educational competencies like critical thinking. Collaboration. Communication. Creativity. Cultural intelligence.” You can find Secretary DeVos’ prepared remarks here. Advance CTE released a new fact sheet that highlights the responsibilities of the State CTE Director, what factors might impact this role and how this can promote cross-system collaboration. This entry was posted on Friday, June 8th, 2018 at 11:16 am	and is filed under Legislation. You can follow any responses to this entry through the RSS 2.0 feed. Both comments and pings are currently closed.